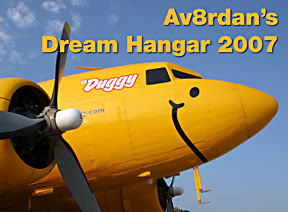 Yesterday, I posted part one of my Dream Hangar 2007 collection, the Top 10 airplanes that would be in my hangar, that is, if I had an Old Growth money tree out back in my forest producing crisp sheets of dead presidents thick on the limb. 5. Air Force One: The avionics it has up front can only be described as awesome, but they pale in comparison to the nifty defensive weaponry it must have hidden down where the luggage used to ride. Damn nice furniture too, and forget about TFRs, you can take this aircraft any damned place you want. Clearance…we don’t need no stinkin’ clearance! 4. Three-Eight Charlie: Jerrie Mock flew this highly-modified 1953 Cessna 180 from Columbus, Ohio, around the freakin’ world solo to be the first woman to make that trip since Amelia Earhart went missing with her old pal Fred. Corner me someday and I’ll tell you the long story of N1538C and why this plane is so special and sadly so ignored in aviation history. Shameless plug: Info on my screenplay about Jerrie and her historic trip can be found here. 2. Pilatus PC-12: This wonderful airplane has moved up to No. 2 this year because over the years, I have grown to love the seriously ‘useful’ useful load and mondo cargo door of the PC–12. 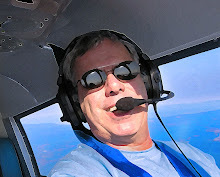 Yes, a Citation Mustang flies higher and faster, but as Dr. Phil says, let’s be real...I will never EVER get any insurance carrier to insure me to fly a Citation single pilot – regardless of premiums. But the Pilatus has a reputation as a safe, easy flier with a very low accident rate. And for some reason, when you attach a propeller to a turbine engine, premiums go down. If you've ever watched a PC-12 drop into an undeveloped patch so short that it'd feel just about right to a Piper Cub driver, then you know the short field capabilities of a Pilatus. Sign me up for one...it has it all. 1. Cirrus SR22-GTS: For the money, the best new airplane sold today. Any more glass in its spacious cockpit and you’d think you were at the Monterey Bay Aquarium. This plane used to be No. 4 on the list, but now claims the top spot since I've flown one and fell farther in love. In all honesty, I have never flown the Columbia 400, which I suspect is very nice. But I was so impressed with the SR22-GTS, I cannot imagine how a four-place composite GA personal airliner could be any nicer than the Cirrus. There you have it boyz and grrls. Again, I am asking my readers to drop me an email here and tell me your personal Top 10…I’ll publish them in the future if I can. 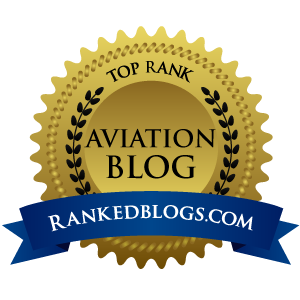 Some lists are already coming in, and it is tons of fun to look into the minds of other pilots and view their dream hangar. UPDATE #1: 0409Z: I might have found out why Duggy is smiling...Mitch Carley, Duggy's creator writes to tell me the Dugster will have a bit part in this movie. UPDATE #2: 12/28, 00:45Z – A couple of readers have thrown in their two cents worth on this topic. The Pelican says his top five would be a Lockheed Super Connie (in T-Dub colors), a Grumman Goose, a DeHaviland Beaver (on floats), a North American B-25 Mitchell Bomber and “absolutely” a DC-3. Adam V from Salina, Kansas lists his top 10 single-engine picks as (10) Aviat Husky; (9) Maule MX-7-180B/C; (8) Cessna 210; (7) AOPAs Win-a-Six Cherokee 6 260 or Piper 6XT; (6) Beechcraft A-36; (5) Piper PA-46 Malibu Mirage; (4) Pilatus PC-12; (3) Cirrus SR-22 GTS; (2) Lancair IV-P and his top choice, a Socata TBM-850. He also lists a Piaggio Avanti II on his list of Top 10 multi-Engine/jet, which has a Boeing 737-800 BBJ2 in the top spot.